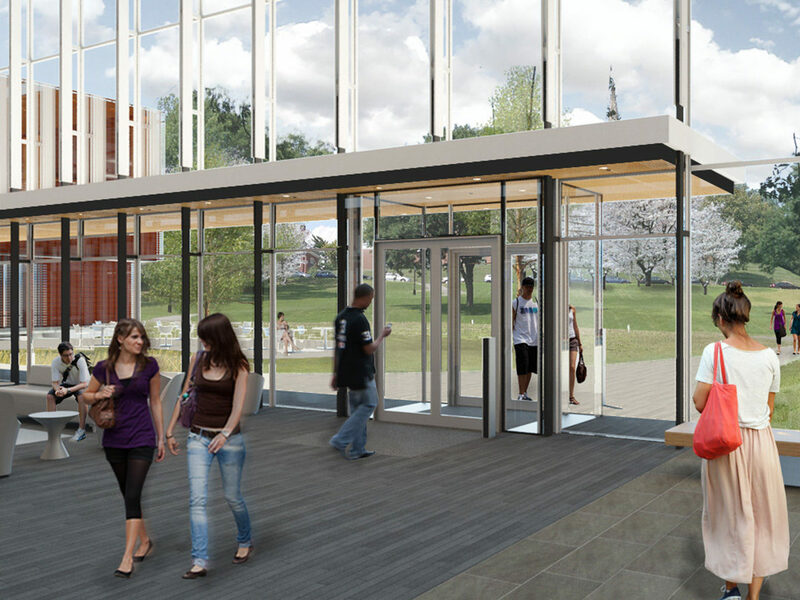 Work is progressing swiftly at the new Amherst College Science Center, set to welcome classes and research activities in the Summer of 2018. 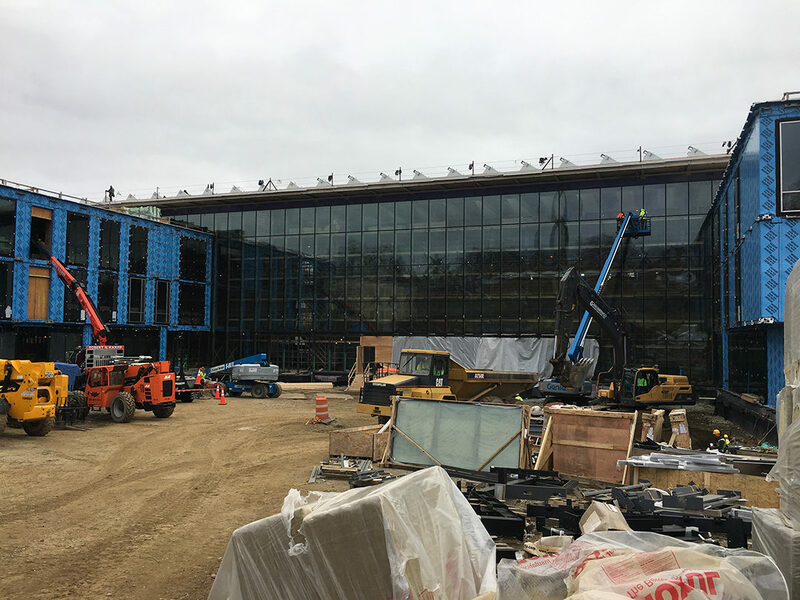 Nearly complete are several important building enclosure and mechanical systems that will work together to make this one of the most energy efficient buildings of its kind. 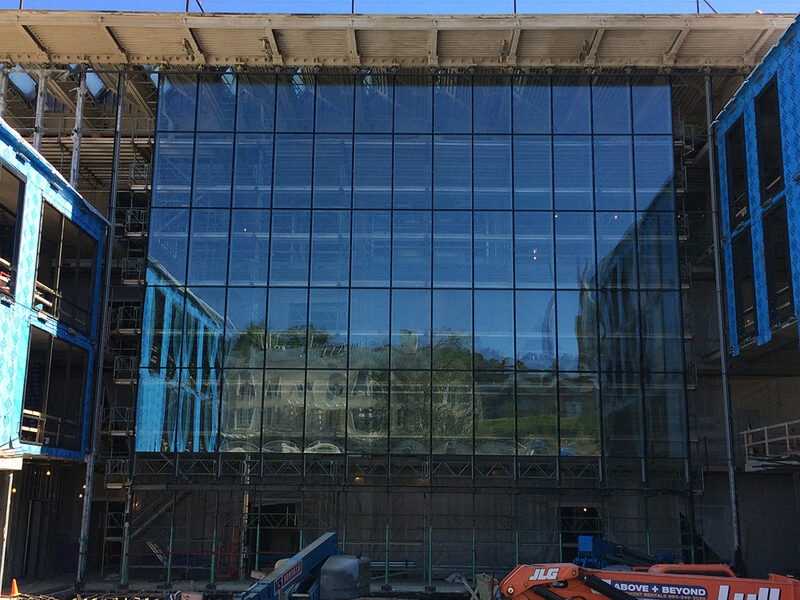 The most visible component is the triple glazed curtain wall, designed in collaboration with Studio NYL and Novum Structures, that faces the new campus Greenway. Spanning vertically up to 66’, it’s hung on slender steel bars from the cantilevered roof with only small steel plates at the base to resist wind loading. This design minimizes materials and allowed for slender, custom support brackets that optimize against thermal bridging. 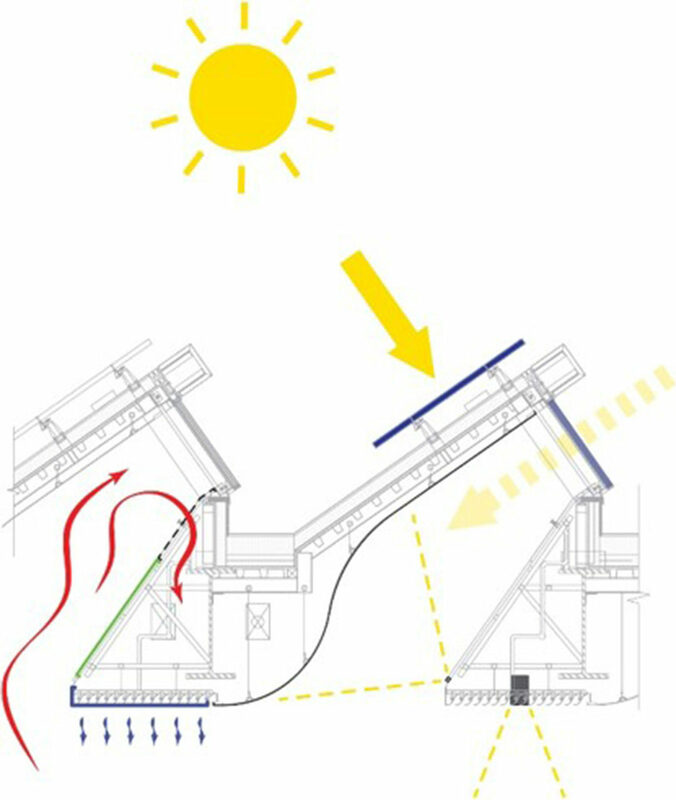 These brackets also integrate supports for the automatic shading system, deployed to control glare and solar gain. The multipurpose light monitors define the upper surface of the Commons. These angled elements will support a rooftop photovoltaic power array. North facing skylights balance daylight to be reflected along the curved glass-fiber reinforced soffit panels. Framing is now in place below these to support acoustic absorption panels and a radiant heating/cooling system. 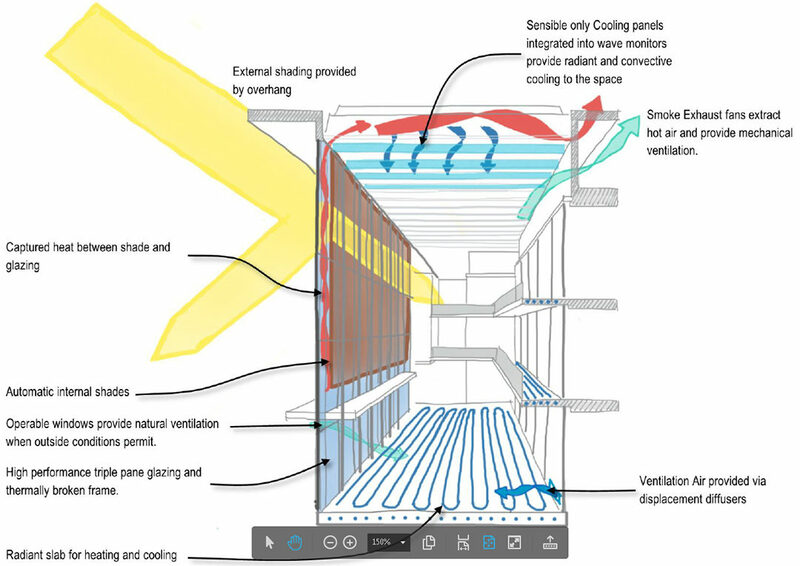 Collecting warm air rising along the curtain wall, wave shaped radiant panels that form the base of the monitors (and roof of the commons) will generate a convective flow to condition the space and act as large scale chilled beams. Not as prominent a feature as the monitors, a system of radiant tubing is embedded within the floor of the Commons and the elevated walkways. 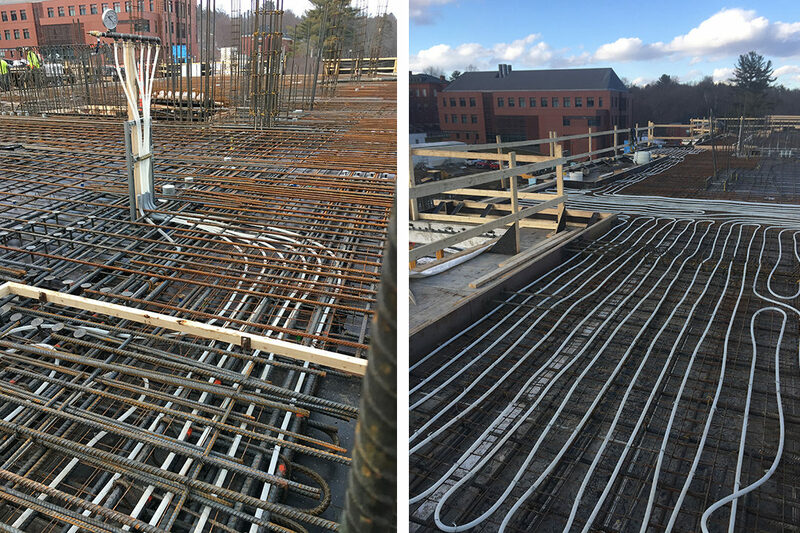 With thousands of feet of piping connected to the building hydronic system through a series of manifolds, the activated slabs will further ensure thermal comfort in the space. While the Commons makes less that a quarter of the building’s annual energy use, we’re still on track to achieve an 72% overall energy reduction. We project an energy use intensity of less than 92 kBtu/square foot/year – that’s less than a typical commercial office building for a world-class science research facility! 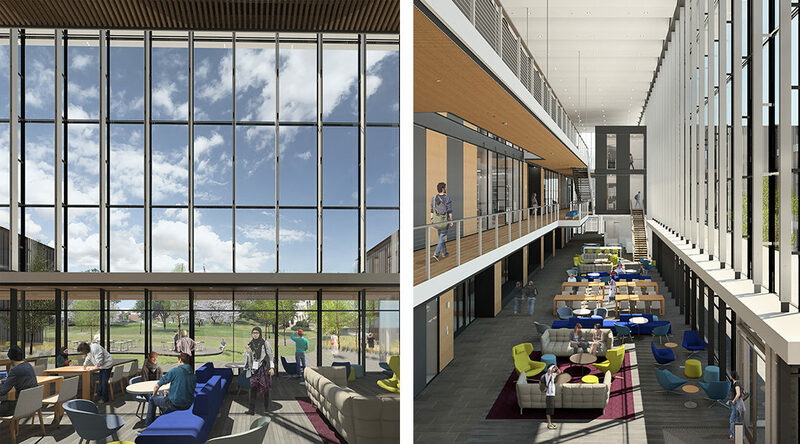 With each day the creative teamwork of our architects, engineers, consultants, manufactures, fabricators and the College’s facilities group moves another step closer realization: a pleasant, efficient and comfortable space that will bring together all members of the Amherst College community.